This unique blend crafted Rosewood, Frankincense, Spruce, and Blue Tansy to create precise cellular communication to target the skeletal system and its connective tissues of the spine to provide stability and support to the entire skeletal system. This results in assisting the connective tissue to relax and strengthening the myofascial cells. Chiro Touch blend also has positive outcomes for mild allergies and a more consistent replication of skin cells. Add a hot and cold compress to the desired location after applying Chiro Touch™. 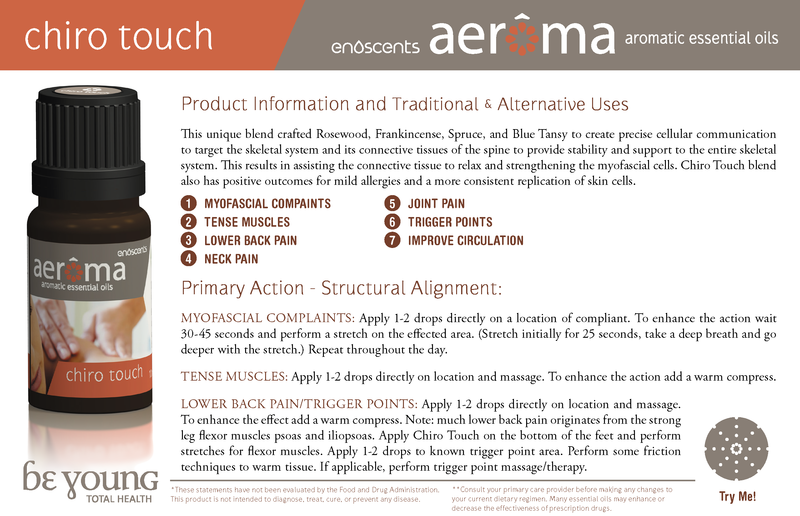 After applying Chiro Touch™ to desired location cup your hands and inhale the scent for 2-5 minutes.